Elasmobranchii (/ɪˌlæzməˈbræŋkiaɪ/) is a subclass of Chondrichthyes or cartilaginous fish. 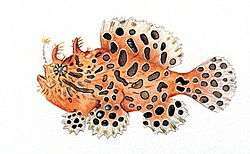 Members of this subclass are characterised by having five to seven pairs of gill clefts opening individually to the exterior, rigid dorsal fins and small placoid scales on the skin. The teeth are in several series; the upper jaw is not fused to the cranium, and the lower jaw is articulated with the upper. The details of this jaw anatomy vary between species, and help distinguish the different elasmobranch clades. The pelvic fins in males are modified to create claspers for the transfer of sperm. There is no swim bladder, instead these fish maintain buoyancy with large livers rich in oil. 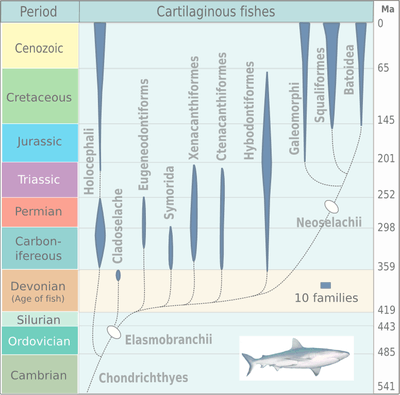 The earliest elasmobranch fossils came from the Devonian and many surviving orders date back to the Cretaceous, or even earlier. Many species became extinct during the Permian and there was a burst of adaptive radiation during the Jurassic. Extant species are classified under Selachii (Selachimorpha), the modern sharks, and Batoidea, the rays, skates and sawfish. ↑ Märss, T.; Gagnier, P. Y. (2001). "A new chondrichthyan from the Wenlock, Lower Silurian, of Baillie-Hamilton Island, the Canadian Arctic". Journal of Vertebrate Paleontology. 21 (4): 693. doi:10.1671/0272-4634(2001)021[0693:ANCFTW]2.0.CO;2. 1 2 Vannuccini, Stefania (2002) Shark liver oil products In: Shark Utilization, Marketing and Trade, Fisheries Technical paper 389, FAO, Rome. ISBN 92-5-104361-2. ↑ Fowler (2005). "Cetorhinus maximus". IUCN Red List of Threatened Species. Version 2010.3. International Union for Conservation of Nature. Retrieved October 26, 2010. 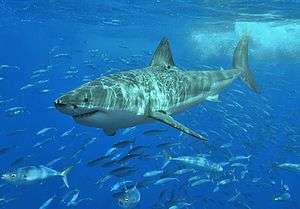 ↑ "Galeorhinus galeus (School shark)". Iucnredlist.org. 2005-06-17. Retrieved 2013-03-26. ↑ Guallart; et al. (2006). "Centrophorus granulosus". IUCN Red List of Threatened Species. Version 2006. International Union for Conservation of Nature. Retrieved 11 May 2006. 1 2 Hoenig, J.M. and Gruber, S.H. (1990) "Life-history patterns in the elasmobranchs: implications for fisheries management" In: Elasmobranchs as living resources: advances in the biology, ecology, systematics and the status of the fisheries, eds. J. H. L. Pratt, S. H. Gruber and T. Taniuchi, US Department of Commerce, NOAA technical report NMFS 90, pp.1–16. ↑ Wilga, C. D. 2005. Morphology and evolution of the jaw suspension in lamniform sharks. Journal of Morphology, 265, 102-119. ↑ Wilga, C. D., Motta, P. J. & Sanford, C. P. 2007. Evolution and ecology of feeding in elasmobranchs. Integrative and Comparative Biology, 47, 55-69. ↑ Wilga, C. A. D. 2008. Evolutionary divergence in the feeding mechanism of fishes. Acta Geologica Polonica, 58, 113-120. ↑ Bigelow, Henry B.; Schroeder, William C. (1948). Fishes of the Western North Atlantic. Sears Foundation for Marine Research, Yale University. pp. 64–65. ASIN B000J0D9X6. ↑ Oguri, M (1990) "A review of selected physiological characteristics unique to elasmobranchs" In: Elasmobranchs as living resources: advances in the biology, ecology, systematics and the status of the fisheries, eds. J. H. L. Pratt, S. H. Gruber and T. Taniuchi, US Department of Commerce, NOAA technical report NMFS 90, pp.49–54. ↑ Bone Q and Roberts BL (1969) "The density of elasmobranchs" Journal of the Marine Biological Association, 49: 913–937. ↑ Palmer, D., ed. (1999). The Marshall Illustrated Encyclopedia of Dinosaurs and Prehistoric Animals. London: Marshall Editions. p. 26. ISBN 1-84028-152-9. ↑ Winchell, C. J., Martin, A. P. & Mallatt, J. 2004. Phylogeny of elasmobranchs based on LSU and SSU ribosomal RNA genes. Molecular Phylogenetics and Evolution, 31, 214-224. ↑ Douady, C. J., Dosay, M., Shivji, M. S. & Stanhope, M. J. 2003. Molecular phylogenetic evidence refuting the hypothesis of Batoidea (rays and skates) as derived sharks. Molecular Phylogenetics and Evolution, 26, 215-221.